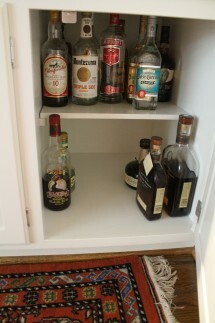 When we were town house hunting last winter, we had a list of “must-haves.” A wet bar was not on the list. However, when we saw one in the place we ended up buying, we were beyond thrilled. 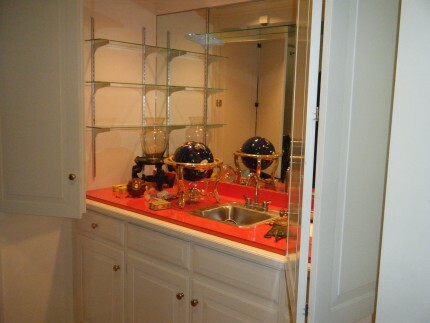 It was tucked away in a corner at the end of the foyer and away from the kitchen. It meant I could entertain without having our guests end up in the room they always end up in – the kitchen. When we did our total gut job on the place, the bar area also received a face lift. Yep, that’s bright orange formica you are looking at. I took this shot on our first visit. Now, I would like to introduce you to the new and improved bar. At this end of the foyer before it opens up into the great room……. Is our new and improved bar. Let’s look more closely. Here it is from the great room entry. 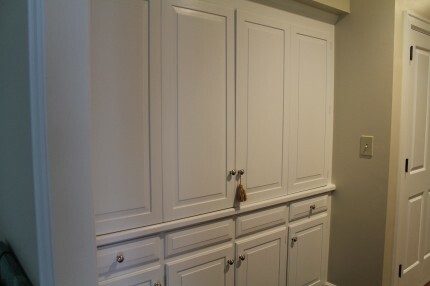 We replaced the orange formica with brushed/sueded/honed (it has different names) black granite. 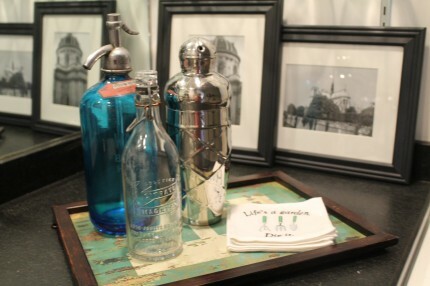 It is the same countertop we used in our bathrooms, again to have that look of continuity I strive for. 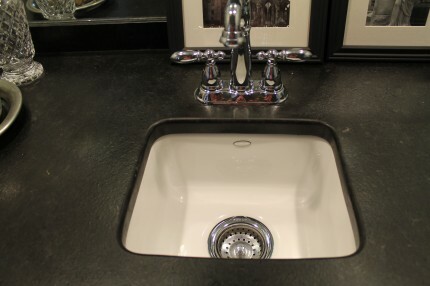 The faucets, which match all of the faucets in the house, are from the Victorian line by Delta, and the sink is by Kohler. 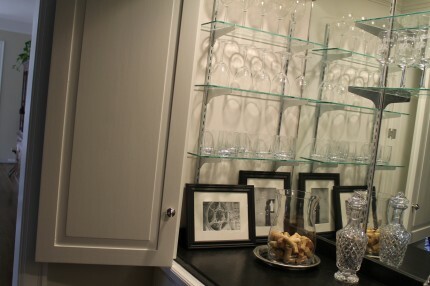 Clear glass shelves hold our bar glasses. 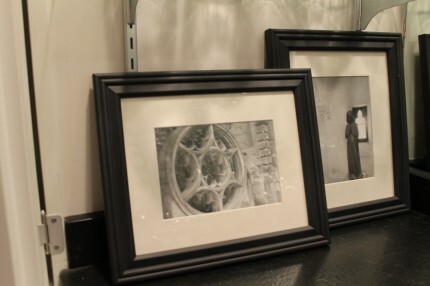 I developed black and white photos from my last trip to Paris and placed them around the bar. You can read about that project here. 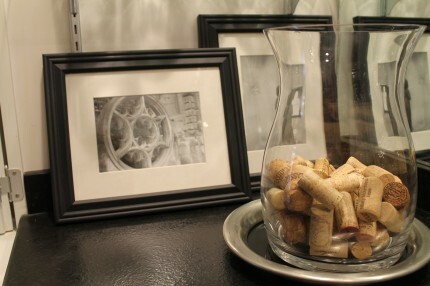 I also have a container of corks just for fun. I think I ‘ll set an unscented candle in there when we’re entertaining. The photos have a very old-w0rld look to them. This is the other side of the bar. I saw a display of hundreds of blue seltzer bottles at a brocante in Paris and knew I had to have one. I bought this one from ebay (read about it here). 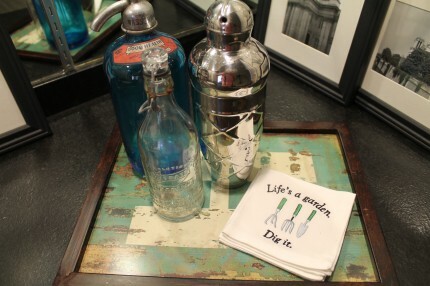 These items are sitting on a distressed tin wall plaque with our last initial on it. It works great as a tray. 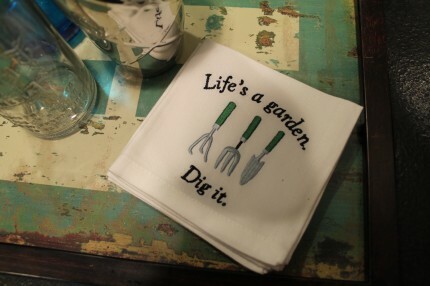 These little cocktail napkins are perfect for summer. 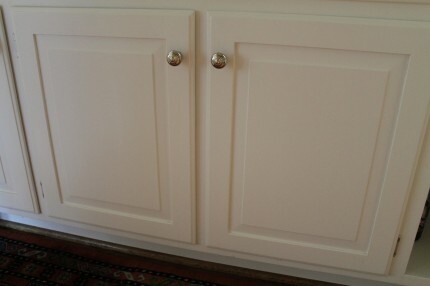 There are three separate cabinet areas underneath and two drawers. 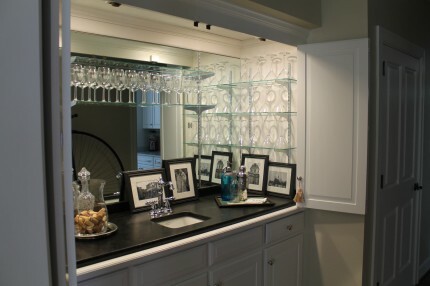 When our wine cabinet in the kitchen is full, we can store the extra bottles here under the sink. 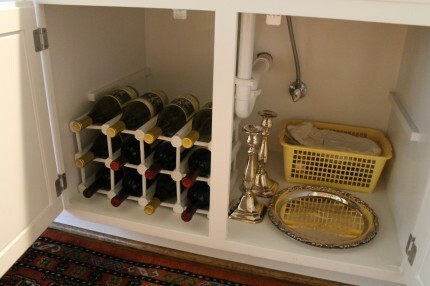 I bought this little wine caddy at Ikea and spray painted it white. I also have a place here to store extra silver which is in the basket also. The plastic basket will be replaced with a wicker one soon. 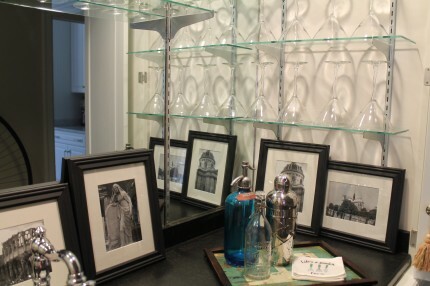 The second cabinet stores our liquor stash, and the remaining cabinet hides our rarely used items, like champagne flutes. They are out of the way, yet easily accessible. 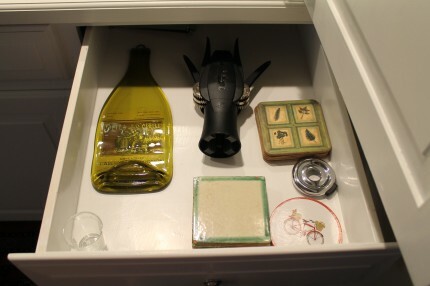 And the drawers hold coasters, a cheeser server, shot glass and my trusty wine opener. 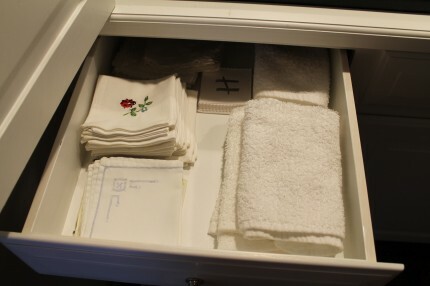 We keep our bar towels and cocktail napkins, both vintage and new, in the second drawer. I think you see now why I love this area. It is not quite finished, though. My decorator friend Beth from The Lone Rearranger suggested I paint the walls in this bar cubby an intense color to give it a Parisian feel. 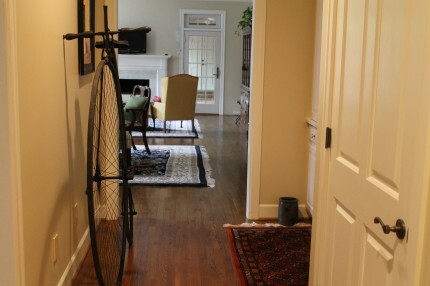 You can see my antique bike (read about it here) in the mirror. We are treating the bicycle, which was built in the 1800’s like a sculpture, and there’s an original bike oil painting beside it. I am thinking of painting the same yellow from the art onto the walls in the bar. I happen to have a little left from another project. What do you think about that? Please remember that if you are ever in the area, stop by for a drink because it will be five o’clock somewhere! I was not paid by Delta or Kohler to mention their products. Looks fantastic! I don’t ever think I ‘ve seen an orange countertop! What were they thinking!!! Your bar is so beautiful and that sunshine yellow color would be just the thing to take it over the top! That looks fantastic! The space is creative and so well designed. Cute accessories too! I really love this… I see many familiar items. All of this is going together so beautifully. Lookin’ good!! I love it too. 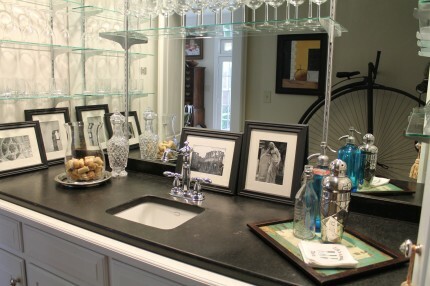 The black granite is so good looking, thought it was soapstone. 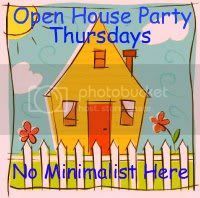 Agree that a vivid yellow would be amazing, esp with the black & white theme. 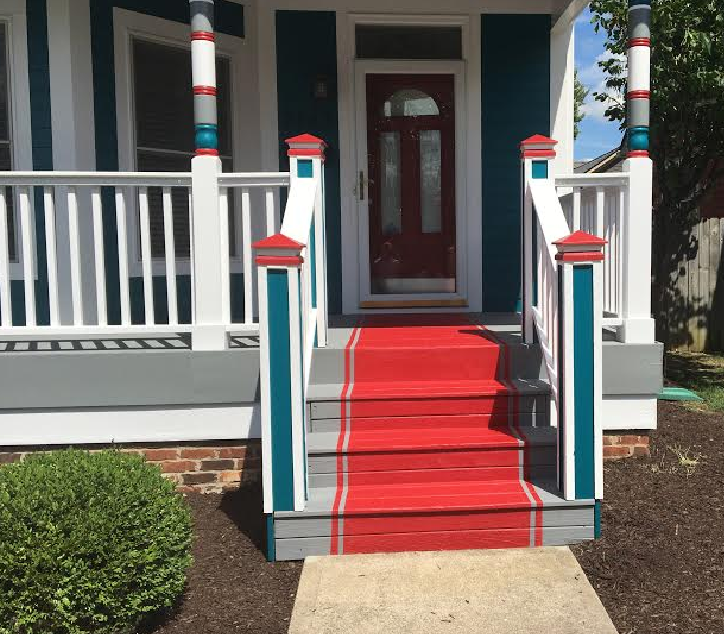 Fantastic makeover! HOW PRETTY! Looks like you are ready for a party!